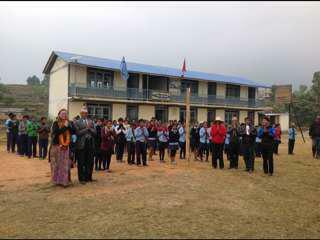 Our school, St Michael in the Hamlet, is linked with a school in Nepal. The school is called Chhachowk and it is in the village of Chhachowk in a mountainous region of Nepal. Sara with the head and students at Chhachowk school in May when she handed over the science equipment. Through the Pahar Trust Nepal, St Michael in the Hamlet have a link with Chachwock in Nepal. Whilst Miss Bennet was in Nepal in February last year she met and supported Chrissy from the Pahar Trust Nepal in running a teacher training day with Dr Sara Parker (LJMU and Fair Connections and also one of our school Governors). This short video shows the impact of this training which used a puppet based resource and book written by Susan Green to develop child friendly approaches to teaching in primary schools. Puppet story sacks and books written in both English and Nepali are being used in Nepal to make learning more engaging and fun. Sara is working with the Pahar Trust and Global Action Nepal to provide resources and training - this video shows the impact that this is having. The books and puppets are also being used in the UK to help children learn about Nepal. When learning another language it's important to consider the impact of tome and intonation. Baby monkey book shows the impact of being rude and polite and the importance of saying please when asking for help!